Clara and Merritt unfolds amidst the violent strife between longshoremen and Teamsters in Seattle in the 1930s and '40s. When Clara Hamilton, the duaghter of a longshoreman, and Merritt Discoll, a member of the Teamsters, fall in love, their relationship is immediately threatened by the fierce antagonism between the rival unions. Encompassing the West Coast labor movement, World War II, the rise of McCarthyism, the Northwest School of Art, and much more, this profound and multi-layered novel explores how people reckon with the larger forces of world events in their everyday lives--and extends author Peter Donahue's remarkable investigation of Northwest history. "Clara and Merritt is rich with details that give life to a little-known chapter of our past. Donahue draws us into a panoramic, dramatic sage--events that affected the entire Pacific Northwest and generations to come." "Peter Donahue has crafted an impressive, fully imagined, satisfying drama, and Clara Hamilton ranks among the most endearing and inspiring heroines in Northwest literature." 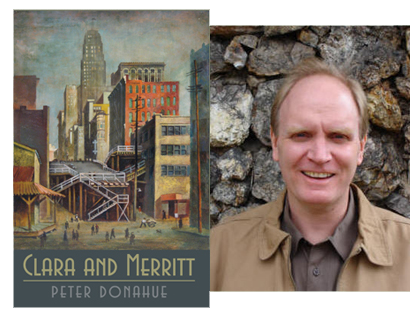 "Decades before Seattle became known for Microsoft and Starbucks, the city was a muscular place where working men labored hard...Peter Donahue's Clara and Merritt captures that brawnier city from the 1930s and 1940s when the Teamsters and more radical International Longshoremen Association battled for labor supremacy...Like the best historical fiction, Donahue's well-paced novel...provides a strong sense of place and well-drawn characters to convey its time." "...vivid characters, persuasive storytelling, rich noirish detail, and a deep sense of time and place." Peter Donahue is the author of the novel, Madison House, winner of the Langum Prize for American Historical Fiction, and the short story collection The Corneilius Arms. He is co-editor, along with John Trombold, of the anthologies Reading Seattle: The City in Prose and Reading Portland: The City in Prose. He writes the Retrospective Reviews column on Northwest literature for Columbia: The Magazine of Northwest History, and teaches creative writing and journalism at Birmingham-Sourthern College in Alabama.